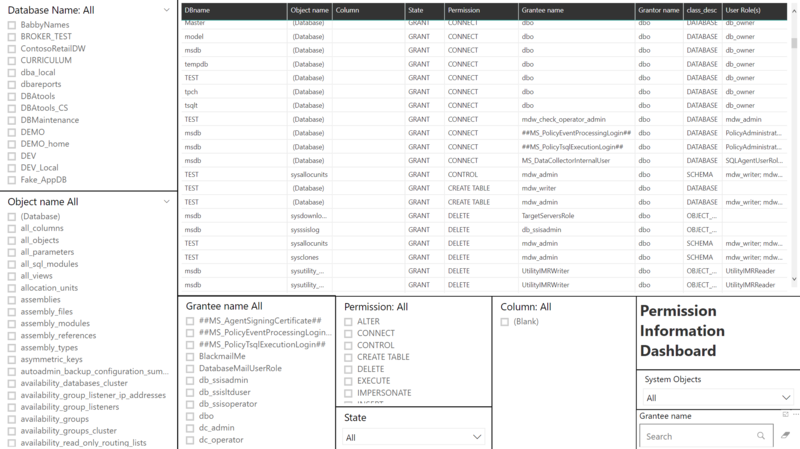 When working with SQL Instances that have lots of databases, sensitive data and equally lots of users/applications that accesses those, it can get pretty troublesome to keep track of every user, for every database, down to the single column/action. That’s why I developed this report, in orde to be able to quickly determine the security status of each object or user in the system. The granting information can be filtered for each Database, Object, Object Column, Type of object, User, Type of Permission and Permission State, and it returns information on everything that may interest you in auditing this kind of information, including the user roles (if it has any). The neat part of this report is that is completely self-contained, there is no need for any external procedure or component to live on the server, you can just publish the Report to the cloud and have it refreshed through the PowerBI gateway (and a user that has access to the security DMV, of course). If you don’t have permissions to fetch this kind of information from all the databases, those will be skipped without blocking the output for the others. It’s the core of the report, basically loops via Dynamic SQL through all the databases, skipping those where the user running the report doesn’t have the right privileges. Why identity values can jump by the 1000’s ? Is it normal?